Posted in Health Websites, News, Nurture Self, Quickies, Things To Do, Wellness | Comments Off on Teach Your Kids To Cook! Another article (click here) about the effects of women in the work force and stress. Ladies, are we listening yet? What is your most effective way of relieving stress? I just saw a notice for Organicfest – Celebrate Everything Organic – which will be held on September 11th at Pack Square in Asheville. Click here for more info. Sounds like fun! I recently met Dr. Sara Rose who is an author and specialist in the field of Divorce Support and Relationship Counseling. I think we all know how imperative it is to have healthy relationships in our lives, not just for our emotional and spiritual health, but for our physical health as well. 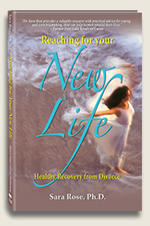 I urge you to check out Dr. Rose’s website (click here) and her book, Reaching for Your New Life – Healthy Recovery from Divorce. Don’t you just love the title? Instead of thinking of the end of a relationship as a failure, I really like the idea of putting energy towards “reaching for your new life”. I can personally attest to the truth in this article. I could never survive the ups and downs of my life without my “chosen family”, all the people in my life with whom I have the most intimate relationships. Here is an interesting article that talks about just how important our relationships are to our overall health. So the next time you want to do something healthy, read this article (click here) and then phone a friend! For anyone in the Charlotte/Matthews, NC area, there is a meet-up this Sunday, May 23rd to come together and brainstorm about how to make a real-food difference in our community. If you’re interested in being a part of this important effort, check out the details at the meet-up website – click here. Next time you think you aren’t an artist because you don’t have any special skills or know any special techniques, check out David Hrobowski’s work. (Click here for great photos). Yes, all that work is done with popsicle sticks. The same kind we all glued together to make goofy stuff in girl scouts or pre-school. Obviously David was an over-achiever in this area. His work is absolutely amazing and reminds us that we should never let anything stand in the way of our self-expression. No fancy stuff necessary. Save your popsicle sticks (or go to Michael’s and buy the bag of new ones – less calories that way, I suppose) and grab the Elmer’s glue and see what you can come up with! There are so many people out there in the blogosphere that it can get overwhelming and frustrating. When I run into any that I think might be helpful, I will post a link so that you can check them out and see if they speak to you. www.marksdailyapple.com makes me laugh (he’s a tad sarcastic, I wonder why I like him!) and has a lot of really good, common sense information about what he calls Primal Nutrition and Primal Eating. The basic premise – EAT REAL FOOD. Told you I liked him! Click here if you want to check him out.